Everyone knows about the pecs! They make you bench press heavy and go to any beach and you can count the number of guys shamelessly flexing them off on the beach! 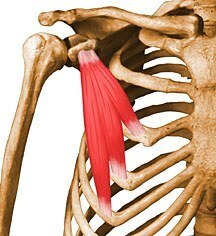 What a lot of people don’t know is how important these muscles are for the healthy and natural movement of the shoulder and neck. The pectoralis muscle group is made up of the pec major and pec minor. The pec major attaches the upper arm bone to the collar and breast bones, with its main function being to adduct and internally rotate the upper arm bone. The pec minor runs from the 3rd-5th ribs to the forward projection of the shoulder blade, thereby helping to stabilise the shoulder blade in to the chest wall. Balancing mechanics in this area, like any other area of the body, is extremely important. Overuse, over-training and prolonged postures can all lead to altered mechanics of these muscles and contributing to rounded shoulders and slouched postures. The shoulder blade will also be pulled in to an anteriorly tilted position, impacting on the shoulder joint’s ability to move optimally. There are many varied and wide ranging issues that can present as a result of pectoralis muscle dysfunctions. The most common that we would see in the clinic arise from prolonged slouched positions. This can result in pain and/or restriction in neck movements and stiffness and pain in the upper back. It can increase the likelihood of rotator cuff pathologies and impingement, as well as restricting shoulder range of movement. It can even result it in neuropathic pain in the arm. These are but a few of the things we would see on a daily basis that pec dysfunctions contribute towards. What can a physio do to help you? Getting the pec released is likely to be rewarding in improving the mechanics of the area in the short term. If, however, that’s all that gets done you’re unlikely to get anywhere in the medium or long term! If the pecs are an issue it is likely part of a wider issue and there is likely a muscle imbalance somewhere in the region. Muscle balance is so important to optimising movement. As physiotherapists we are the experts at finding the underlying cause of why your pecs are causing issues for you and we will determine an individual treatment and strengthening plan that will help you overcome this imbalance!